140801 | St Michaels - again under threat? Submitted by via Hayle Herit... on Mon, 01/04/2019 - 00:00. Join us on the 5th of June for a talk on Hayle’s prehistoric industry, discussing the recent excavations at Trevassack Hill. This event forms part of our Summer talks programme. 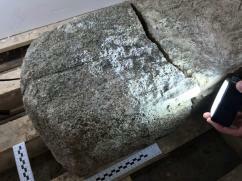 Come along to the Hayle Heritage Centre on the 3rd of July at 7pm for a talk on the 3D scanning of the Cunaide Stone. The stone forms part of the Hayle Heritage Centre’s new exhibition on the early history of Hayle, from the Paleolithic Era to the 5th Century. The mysterious stone is Cornwall’s oldest identified burial stone, so this talk promises to be fascinating. This event forms part of out Summer talks programme. Join us on the 7th of August at the Hayle Heritage Centre for a talk on Hayle’s rich history with Trevor Smitheram. This event forms part of our Summer talks programme. 5th Oct, Testing Times in Cornwall by Peter Channon. 2nd Nov, Humour in medicine and Surgery by Keith Harrison. 7th Dec, How it all began by Mr Rodda. 1st Feb, Mining in Ancient Europe by Julie Wileman.